BOLLING AIR FORCE BASE, Washington, D.C. (May 24, 2007) -- Author Robert Coram visited the Bolling Library May 23 to sign copies of his new book, "American Patriot - The Life and Wars of Colonel Bud Day." Retired Col. George E. Bud Day, served his country in the U.S. Marine Corps during World War II. Following that war, he earned a law degree and joined the National Guard. But by 1951, he'd been called again to active duty for service in the Korean War. Col. Terry L. Ross, 11th Wing vice commander, was one of many members of the Bolling Air Force Base community to get an autograph from author Robert Coram. 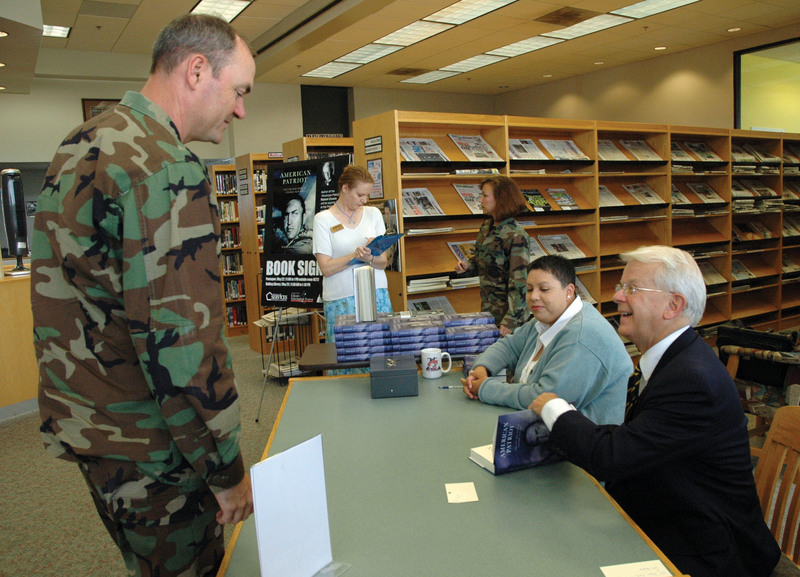 Coram was at the Bolling Library, May 23, to sign his new book, "American Patriot - The Life and Wars of Colonel Bud Day." Colonel Day served in Korea as an F-84 Thundercat pilot, and later as a pilot in Vietnam. It was there he was captured, not once, but twice, by the North Vietnamese. When Colonel Day returned from Vietnam, after six years in captivity, he chose to return to flying status. He didn't retire until 1977. Colonel Day is the recipient of the Medal of Honor, awarded for his bravery during his captivity. He is also the most decorated living officer today, said Coram. "Bud Day is America's most decorated living officer, and most decorated American since Douglas MacArthur," Coram said. "He has about 50 combat medals, some 70 medals in all. He is the very best of what we are as a people." After a successful release of his biography of Air Force Col. John Boyd, entitled "Boyd: The Fighter Pilot Who Changed the Art of War," Coram said he was contracted to write two additional books, both military biographies. "A number of ideas and possible candidates were mentioned to me, but Colonel Day was the only one that had that extra quality -- a moral component," Coram said. "It would be more than a list of his accomplishments. It would be a man who showed great integrity and moral courage, at a time when he could have gone any one of several ways." Coram contacted Colonel Day, who at 82 years old, runs a law firm in Florida, and spent the next three-and-a-half years working with him on the biography. Coram said there are lessons from Colonel Day's story, even for Airmen today. "Well, the fact a person is in the military means they are in the profession of arms, he is a warrior. No matter what his AFSC, he can go to war and can find himself in harm's way," Coram said. "When that happens, he needs to know the standard, how high is the bar? What should be his behavior? Bud Day is the man that set the bar, he set the example." Coram said after an Airmen reads Colonel Day's story, they would want their own actions in wartime to mirror his. "They would do what is expected of them because it is upholding not only the honor of the country, but of their fellow Air Force members," Coram said. "They would do what is expected."